Analysis: The Chemical Attacks — Assad’s Responsibility & US Negligence? The Local Coordination Committees report that 155 people were killed across Syria on Saturday, including 22 children and 12 women. 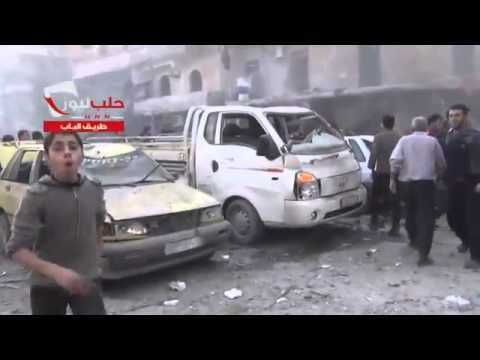 The death toll soared as the regime carried out airstrikes in and near Aleppo. At least 14 people were killed in a vegetable market in Syria’s largest city, while 15 died in the town of al-Bab. The LCC said 64 people died in Aleppo Province,49 in Damascus and its suburbs, and 11 in Homs Province. The Violations Documentation Center records 79,416 people killed since the start of the conflict in March 2011. Of the dead, 58,811 were civilians. We have reliable information of intense battles in the East Ghouta area near Damascus, with scores of regime forces killed. Unconfirmed reports claim that more than 160 people have been killed since Friday when insurgents attacked military checkpoints encircling opposition-held suburbs. “It is a ferocious fight between the two sides because it’s a struggle over our ultimate fate here,” said Bara Abdelrahman, an activist who works with the insurgent Jaish al-Islam. EA’s information is that more than 100 regime fighters have been slain. Most of them are from Shia militias, including fighters from Iraq and from the Lebanese organization Hezbollah. The regime has been trying to break a ring of insurgent-held areas around Damascus for several months. Shaam News Network reports that five media activists were killed on Saturday, covering clashes in the East Ghouta area near Damascus. Two of those slain were citizen journalist Mohammad Attayib and Muhammad Asa’eed, the spokesperson for the Revolutionary Command Council in East Ghouta. RT"@omarsyria: People of Douma praying for 4 media activists killed by regime forces. pic.twitter.com/sOl0ayGRL5"